I would like to focus on the second half of this past weekend’s Nebraska game – on three points specifically. First our opponent stepped up and played better, our hats off to them – their blue-collar ethic rubbed-off on the Oregon defense. Second the coaches let us absolutely stall out on offense, but we can learn a lot from that. Third the defense held! Yeah! Wyoming has a quarterback as good as Pac-12 guys, so our “Cristobal-Leavitt” work ethic will be needed. Bring out another color of the blue work shirts issued to the players earlier this year. The Nebraska team looked well-coached in the second half and could have tied the game once we stalled out on offense giving up those 21 points in the second half. They missed a big opportunity as a team and their quarterback missed some big throws. We must appreciate the toughness Nebraska showed in the second half to make it an exciting game to watch. I’m glad I did not have to block Nebraska’s Mick Stoltenberg, a 6’5″, 305 lb. nose defender who seemed better with each play. The real Nebraska showed up in the second half and they were scary even with a mediocre quarterback. 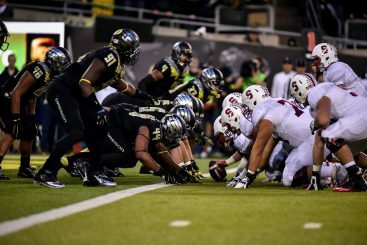 Stoltenberg’s blue-collar workmanlike play was a good example for Oregon nose position players. 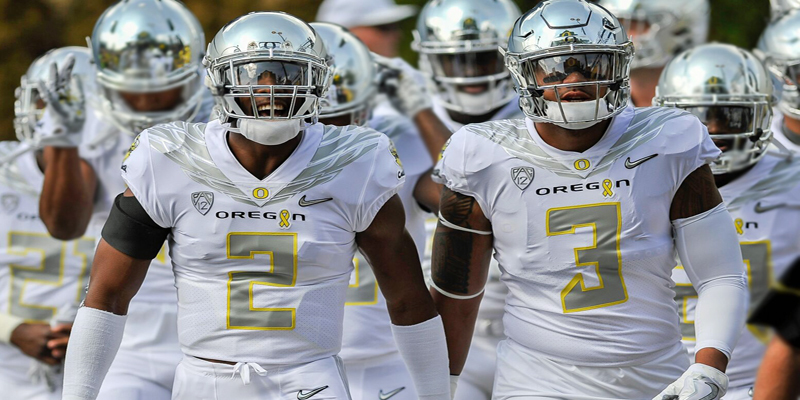 Oregon looked scary in the second half for different reasons. We did not look well-coached on offense; the game plan was off. I was surprised and I think others, including the players, were surprised as well (Charles Nelson noticed we were so slow). Someone please tell me that was not bad offensive coaching in the second half. I was puzzled by our play calls and stalling between plays, burning clock to the extent we lost “the juice.” These players do not want to play that way - that is not Oregon swagger. Taggart totally messed up the team’s rhythm. In the post-game press conference, Nelson said we lost our tempo and running out the clock is understandable, but can we do it through plays that stay in bounds? Nebraska obviously made the normal second half adjustments, and it only took two plays of the “three super running backs at once” until it became easy for Nebraska to defend the play. Pac-12 defenses will be much better than Nebraska. Did that really work against our own defense in practices? Experimentation is good to a point, but too many reps of the “three-back-swag” in the second half of a game will see immediate corrections from the opponent. Maybe we just wanted to show it, not really run all options we have off the formation. We will see how it appears and plays out in the future. We need to be innovative and transform the Oregon defense for the future, so we win championships. Anthony Newman (and many others) keeps saying defense wins championships. I look for clues and recruiting for our defense scheme is one good way to get better fast. (I am adding a side note about the Georgia game and their defensive win for comparison.) After the Notre Dame vs Georgia game, the media reports emerged about the stout Georgia defense, and of course their recruiting for 2018 was noted. The Georgia Bulldog defense won the game against Notre Dame. I looked at their recruiting class for 2018. It was pretty astounding to see all the linemen and the size of those guys. 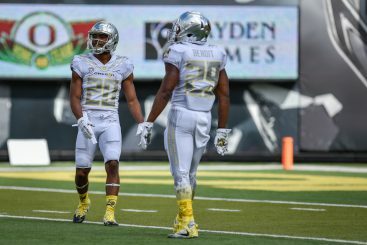 A side-by-side look at Oregon’s class and Georgia’s 2018 class just made me realize how far we have to go to match players to great schemes so we win division/conference championships. The linemen being recruited in 2018 from the state of Georgia averaged 340 plus pounds and there we many to choose from! Georgia is recruiting to their particular scheme and has a plethora of notable selections in recent NFL drafts. Good win for the Ducks, but the ugly part was all the penalties - again. Do that next week against Wyoming quarterback Josh Allen and you could lose that game, because there will not be four interceptions. The penalties are another coaching problem along with not knowing how to handle the second-half collapse of an offense when other good teams adjust. Even Willie Taggart got a penalty! 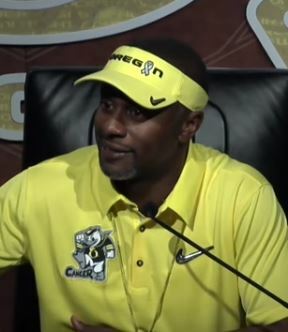 So Coach Taggart, how are we to interpret games when we do not see any swag surfing on the sidelines in Pac-12 games? (Yes I did try it, pretty fun.) We may not see that dance much in Pac-12 games. All business, that’s good. Looking forward to those conference nail biters (I hope the games are close). This whole surfin’ thing may come back around on us as something the Huskies and Cardinal will use against us.